A car chase, a new site and more! Happy birthday Ajay Chauhan! There are friends that call you up and wish you on your birthday. Then there are friends who send mails wishing you. Then there are friends who are happy to wish you through Orkut scraps and Facebook walls. Now, a special request—actually it is not a request, it is a quest. Will the girl who chased him in a silver SX 4 on 22nd April on the roads of Gurgaon at around 11.30 in the morning, please contact him? He wants to ask you out for coffee and has been desperately trying to find out who you are! He even had it as his g-talk status message for 2 whole weeks hoping that someone would be able to tell him who she was. He says he does not know any girl who drives a silver sx4. He was driving to office Shumacher style, as he was late, when this car started following him like crazy. An Italian job style Hollywood car chase ensued. He finally pulled to the side and this really cute girl pulls up beside him ,waves to him and drives off! Since the glasses were tinted in both cars he could not make out who it was and if he wasn’t getting late to work, he’d have jumped out and asked her for coffee right there! In case any of you who read my blog (and more than 700 people read me —thank you folks, I am honoured and delighted!) knows this girl, please pass on this message to her :-) It’s his b’day after all. Let us make the birthday boy’s day! May you continue to shine and grow and may you get whatever you heart truly desires. Loads of wishes and positive vibes are being sent your way. nice birthday gift! loved the post as well.. also Happy birthday mate! Wow, so cool, what a birthday gift! I would love one too, but the only thing is I don't remember anyone chasing me in a car=)Nice post.Have a great day! Happy Birthday to you Ajay and all the best. Aathira, you have no idea :) Thanks though. Nikhil: They're nice as long as noone gets hurt :P :)Thanks for the compliments about my site! Sagarika: Thank you and thank you! Sundari: thank U! feels good to hear after all the work that has gone into it. Sushobhan: thanks so much for the interest. I am waiting eagerly too! Mihir: thank you--glad u liked the post. Ajay surely is lucky to have a friend like you as I am sure you are to have a friend like him. 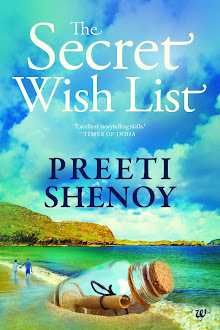 And eagerly awaiting your second book, Preeti. PLEASE have a book launch in Mumbai. Happy birthday Ajay. Have a great day and be careful on the speed factor. Palsworld: I do hope to. A lot depends on publisher. Thank u! Ps: Good luck on the new book. Website is fab. 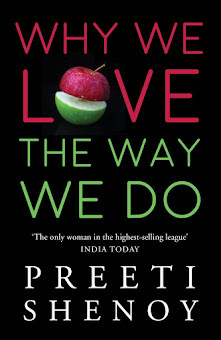 hey preeti, all the best for your second book launch. here's a prediction - it will outsell the first book and will do this in a shorter span of time! Chitra; thank you so much! and belated best wished for your birthday too. When I was a teenager I noted down this quote I came across in my diary, it goes something like... Friendship is unnecessary, like philosophy and art.... it has no survival value; rather it is one of those things that give value to survival. Even now the quote holds good for me :-P.
Congrats on the new website:-))!!! !